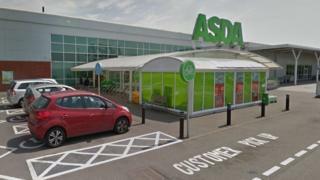 A staff member at a supermarket was injured while attempting to stop a suspected shoplifter, police have said. Emergency services were called at 14:25 GMT to the Asda store on Barkby Thorpe Lane, in Thurmaston, Leicester. Leicestershire Police said a store employee had "received a cut to their hand". A 42-year-old man has been arrested on suspicion of inflicting grievous bodily harm without intent and remains in police custody. Witnesses have told the BBC the injured member of staff was a security guard. Police wrote on Facebook: "Staff had attempted to detain a man on suspicion of shoplifting and in the process, one staff member had received a cut to their hand." East Midlands Ambulance Service said paramedics "assisted with a medical emergency... and treated one patient at scene".